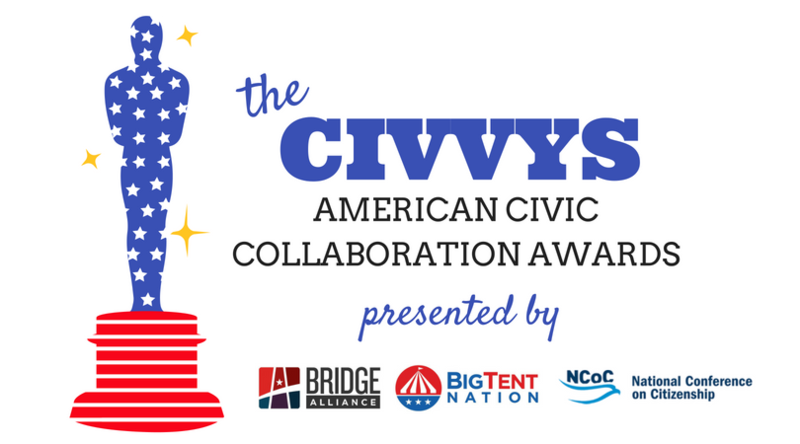 Big Tent Nation and The Bridge Alliance Education Fund, organizations committed to the fight against partisan rancor and division, have joined forces with the National Conference on Citizenship to solicit nominations for the second annual American Civic Collaboration Awards, or the Civvys. The Civvys are the first national awards program highlighting best practices in civic collaboration and collective action that put community and nation before party, ideology and narrow interests. The Civvys will be celebrated this year at the National Conference on Citizenship in Washington, D.C., supporting this year's theme: "It's YOUR Democracy."